Superb luxury villa with private tennis court and infinity swimming pool set in large peaceful grounds. Comprised of the main house and a separate studio all taken together. Very well located just 2km from the centre of the beautiful hilltop village of Saint-Paul de Vence, a big favourite with many of the French acting fraternity. Beach 15km. Golf 20km. Nice airport 30km. Villa accommodation covering 250 m² on 2 floors for 7 people, 4 bedrooms, 2 bathrooms, air conditioning, satellite television, wifi. The ground floor has a spacious light living room with fireplace, upright piano (made by Bord of Paris and tuned regularly) television, DVD player and wi-fi, all tastefully furnished and comfortable with large patio doors opening to the patio terrace. Elegant dining area and an open-plan fully equipped kitchen (with ceramic hob, Nespresso coffee maker, fridge/freezer with ice maker etc.) with breakfast table and access to the summer kitchen and terrace outside. Separate toilet. The garden level has a large master double bedroom (160 cm wide bed) which has French windows opening onto the garden and an en-suite bathroom with whirlpool corner bath, twin sinks and a walk-in shower. Two double bedrooms (140 cm wide bed in each). Single bedroom (90cm wide bed) with desk. Bathroom with bath and walk-in shower. Two separate toilets. Large walk-in dressing room. There is air conditioning in all the bedrooms. The very peaceful secluded grounds are gorgeous, there is a beautiful swimming pool with overflow effect and a small pool above it with a step in it where you can sit and enjoy a drink and the stunning views down to the sea. Large patio terrace and an excellent summer kitchen and outdoor dining area set under a large covered terrace attached to the villa, which is beautifully furnished and has a kitchenette with a "plancha", electric grill, dishwasher, fridge/freezer, sink etc. Below the pool, there is a lawned area where mature trees offer natural shade and a herb and vegetable garden where you can help yourself. There is a tennis court (which is shared only with the villa V50 located next door and the owners which are also next door) for private use (in conjunction with the aforementioned, the system is very simply an amicable one which works perfectly well). 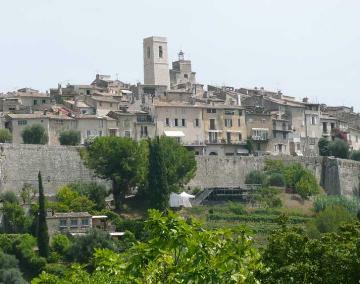 Saint Paul de Vence is a very special village, it is very arty with lots of art galleries and small boutiques lining the narrow streets which lie within the confines of the fortified walls. There is a wide range of excellent restaurants including one of the best on the Cote d’Azur, the Colombe d’Or. It’s a class place. You can walk easily into the village (it takes about twenty minutes) along a quiet leafy small road. It is five minutes walk to the Maeght foundation where you will find a wonderful collection of some of the best modern art in the world. Two-week bookings only without leaving one week gap. Extra cleaning (each day if required) and meal cooking service (usually just Monday and Friday) can usually be arranged on request, for a supplement, payable locally. The studio is only made available on request as it is really only suitable for an au pair or nanny. Property made available in good order and fully equipped. Linen and towels (not beach towels) provided. Local taxes (unless specified otherwise in the villa description), reasonable consumption of services including water, gas and electricity during July and August. Garden and swimming pool maintenance. Four hours cleaning per week. Refundable deposit 1000€ (or equivalent) cash payable locally and credit card details held for maximum payment of 3000€ in the event of damages (or a euro cheque for 2500€ payable locally, which will not be cashed and returned at the end of stay except if there is a reason to do so). Final clean payable locally 150€. Outside of July and August electricity is payable locally according to the house meter reading. Heating for the house and firewood. Additional services (where available) including cleaning, babysitting and cooking.